So. much. happened. 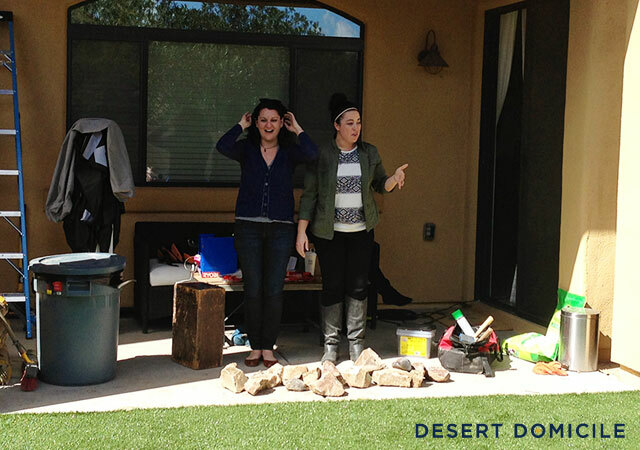 behind the scenes of our Home Depot Patio Style Challenge! All of the work took place over a course of 12, 12+ hour days. I have a terrible memory so every night I would jot down a bunch of notes about what took place during day. I also took a ton of photos every morning before the crew arrived so I could track the progress of our projects. 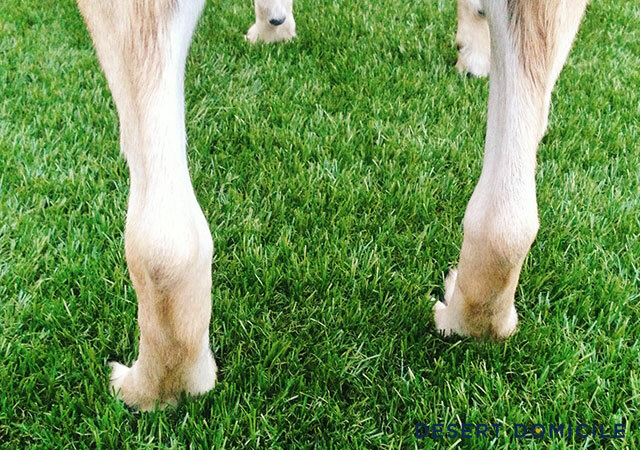 I love seeing what goes on behind the scenes of projects like this and I hope you do to! I put together a timeline of events to help me remember the little details that can get lost in the day-to-day work. Before I dive into the timeline, I should probably let you know that our Patio Style Challenge was all caught on camera! 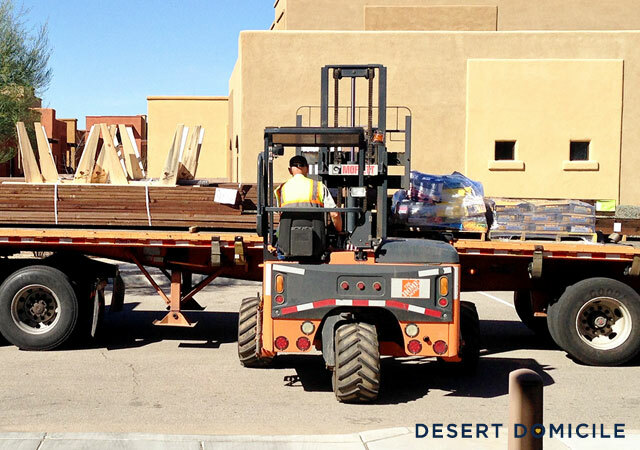 + All of the lumber and concrete we needed for various projects was delivered around 10:30AM. + Two of our contractors arrived from California at 11AM. + We had so many project materials that weren't going to fit into our garage so we had a POD delivered! + Our contractors spent the rest of the day sorting through things, moving furniture to the POD, and unboxing all of their tools and supplies. 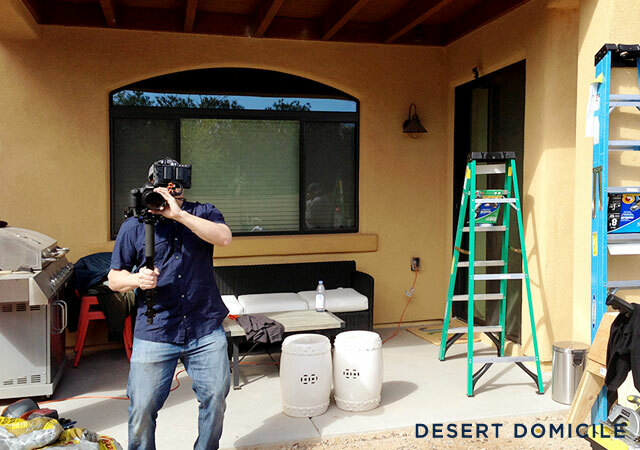 + The B-roll camera crew arrived at 7AM to get before shots and to start the time lapse. They set up Go-Pro cameras in each corner of our yard so they could capture all of the action! 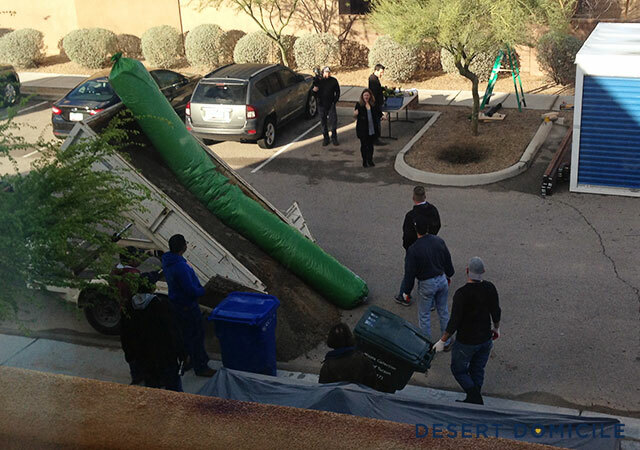 + All three of our contractors arrived at 7:30AM to start construction. + They staked out the deck area and began to dig footing holes with the auger. 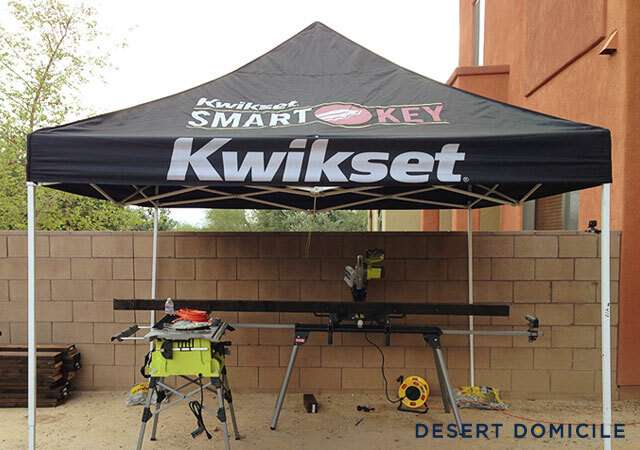 + All of the tools were delivered so they put them together and set up shop in our backyard. + More lumber was delivered along with a few planters. 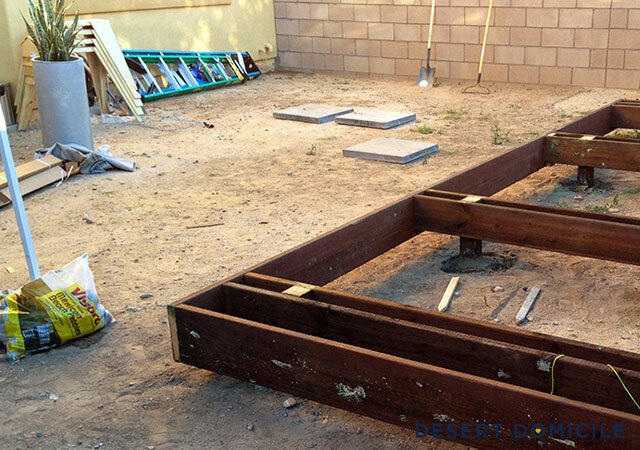 + Concrete was poured into the deck footing holes and the footings were set in place and leveled. + The fire pit area was cleared out and they began to rake and level the yard so they could set the 24" x 24" pavers in place. 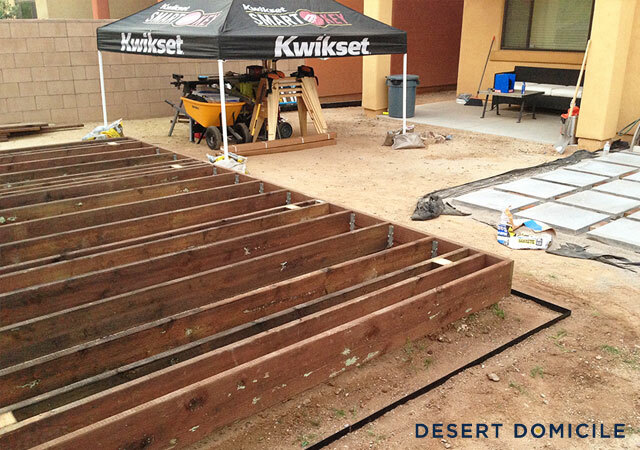 + The base of our deck was built out by the end of the day! + Everyone arrived around 7:30AM. + Our contractors continued to work on the floating deck. Extra supports were added to the interior of the base and the steps were constructed. 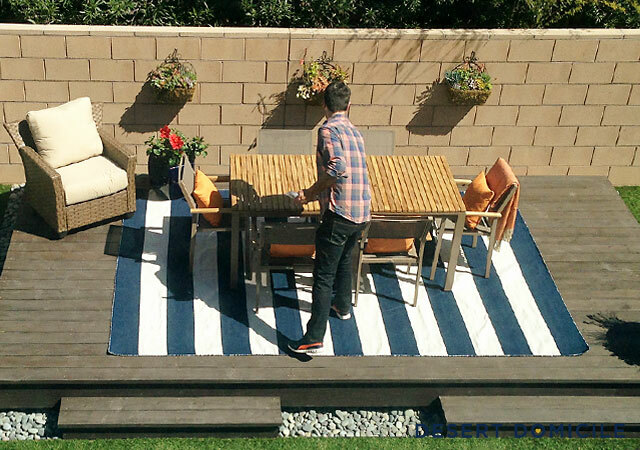 + Landscape edging was added around the outside perimeter of the deck and steps. 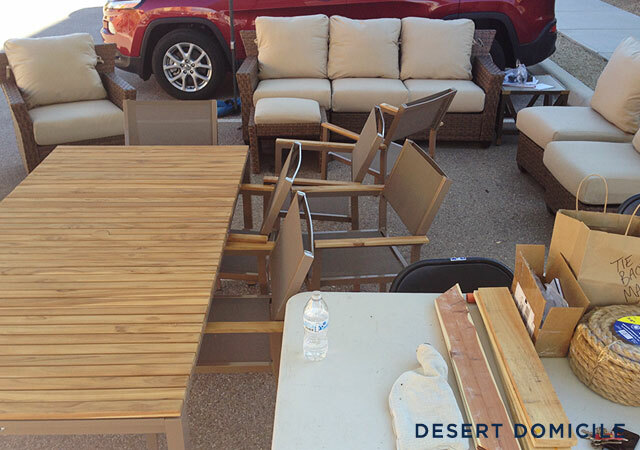 + I went shopping at Home Depot for a palm tree and found a great umbrella for our dining set! + The fire pit area was cleared of rock and weeds and weed block was laid down. 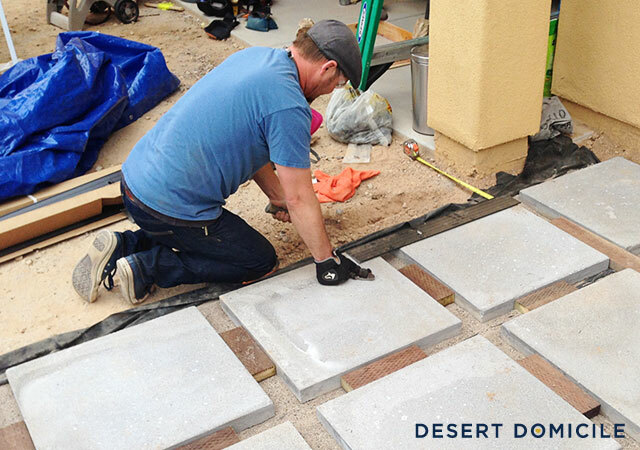 + The ground wasn't level so sand was added on top of the weed block before the 24" x 24" pavers were put in place. 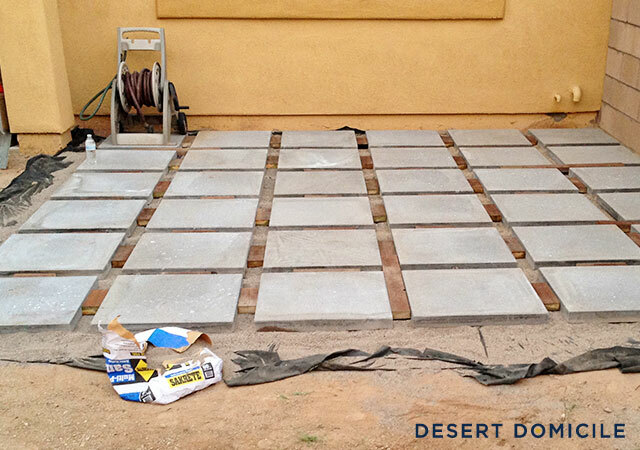 + The pavers were spaced apart with a piece of 2x4 so the pavers wouldn't shift when stepped on. We plan to fill the gaps with rock later on! 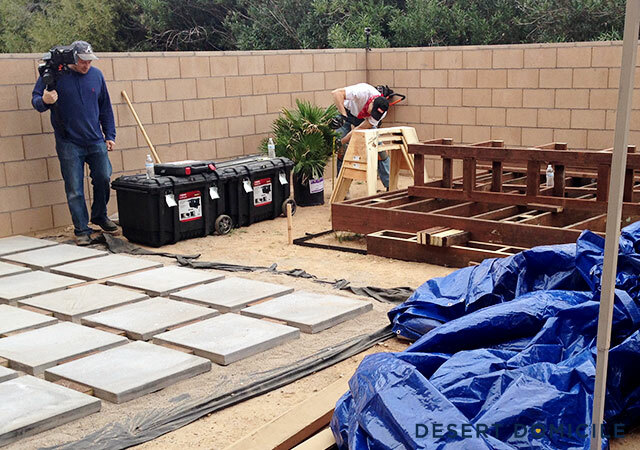 + All of the pavers in the fire pit area were in place by the end of the day! Amazing! + Everyone arrived at 7AM. 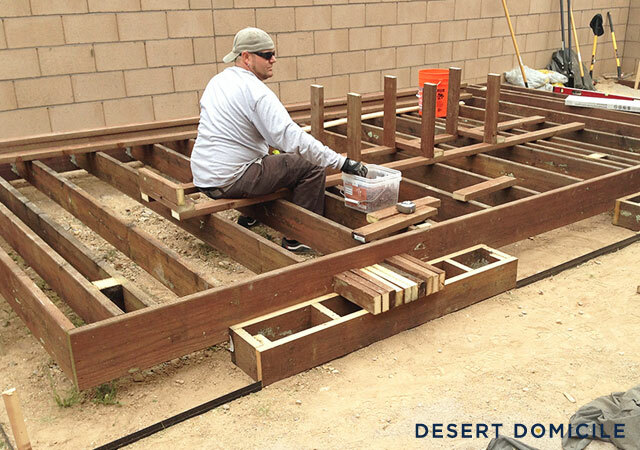 + Our contractors continued to work on the floating deck while I continued to work on my DIY projects! 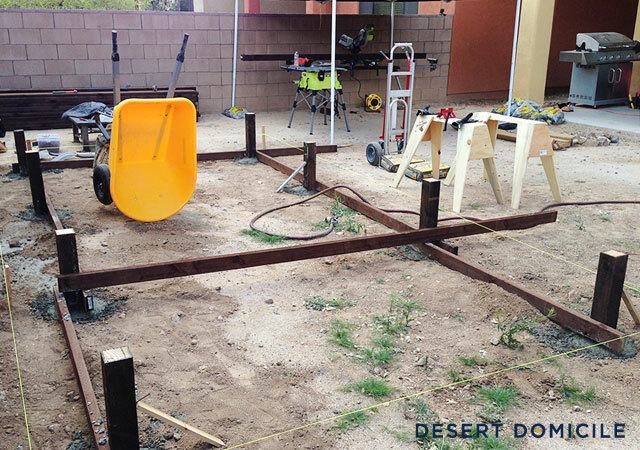 + Work began on the L bench for our fire pit area. + I took a trip to Home Depot to pick up for various supplies and tools we needed. + The palm tree was planted in the ground! + Trenches were dug for the landscape edging around the fire pit area. + It started to rain heavily around 4:30 so all work stopped. 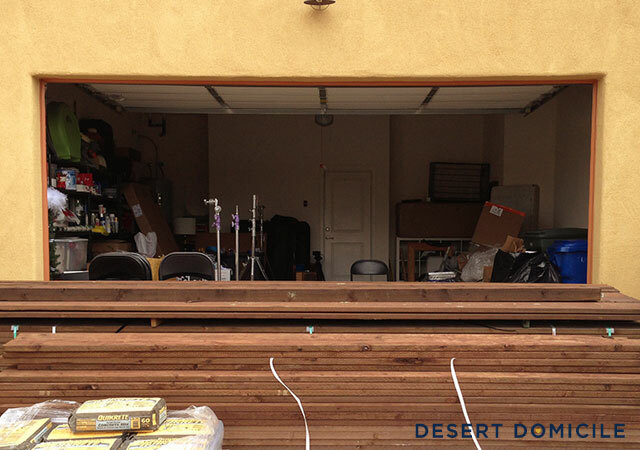 + Our contractors set up shop in a parking space so we could sand and stain all of the boards needed for the deck, slatted screen, and L bench. 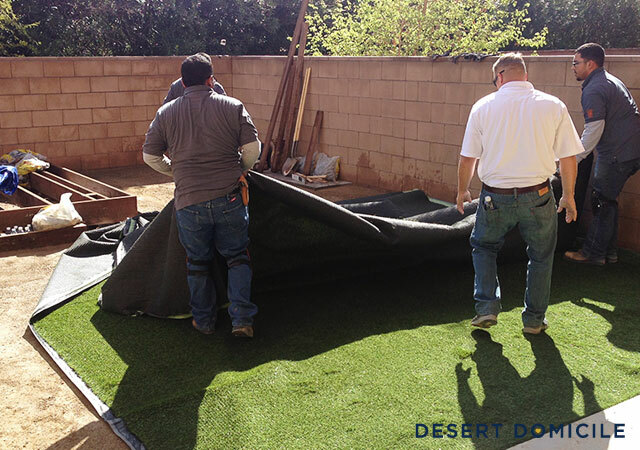 + The AstroTurf arrived around 8:30 and was completely installed by 12:30PM. Everyone was shocked at how good it looked! + The L bench was fully framed out by the end of the day. 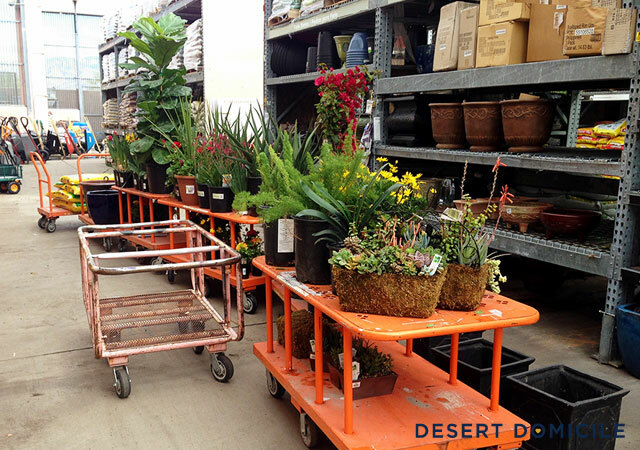 + Several of us took a trip to Home Depot around 8 to shop for all of the plants and planters we needed. 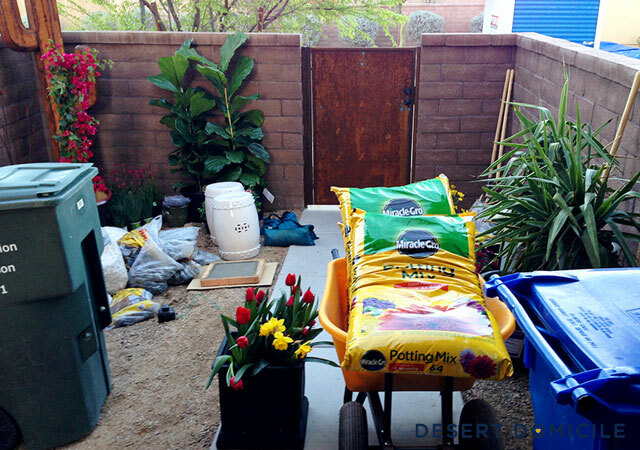 We ended up with 3 flats carts full of plants and 2 flat carts full of soil and rocks! + The L bench was finished. + Decking boards began to go down and the steps were capped off. 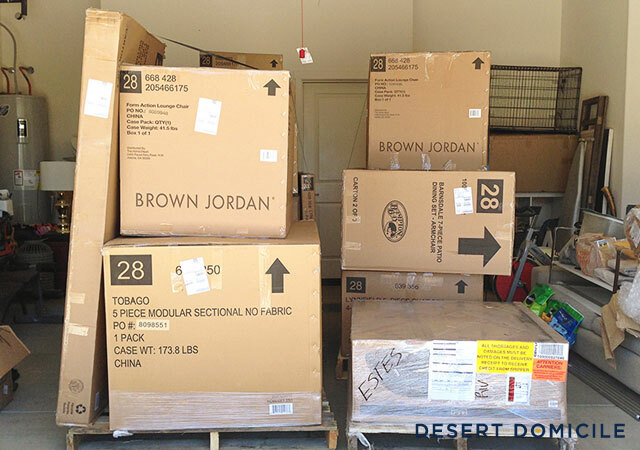 + Our patio furniture was assembled! Doesn't it look comfortable?! + I finished my vertical succulent planter and I made a tie back for our outdoor curtains. 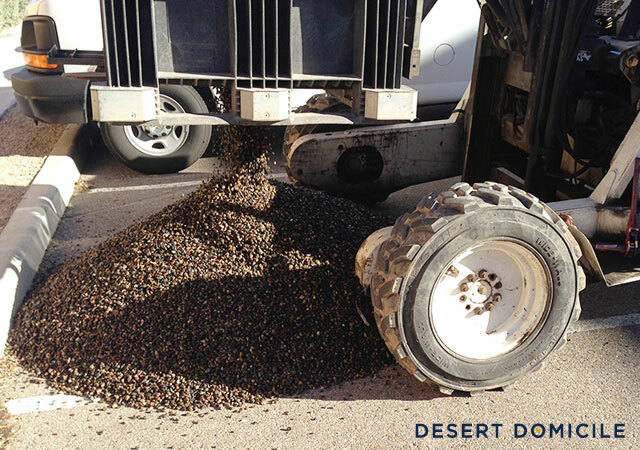 + The landscaping crew arrived shortly afterwards to help with some of the heavy lifting. 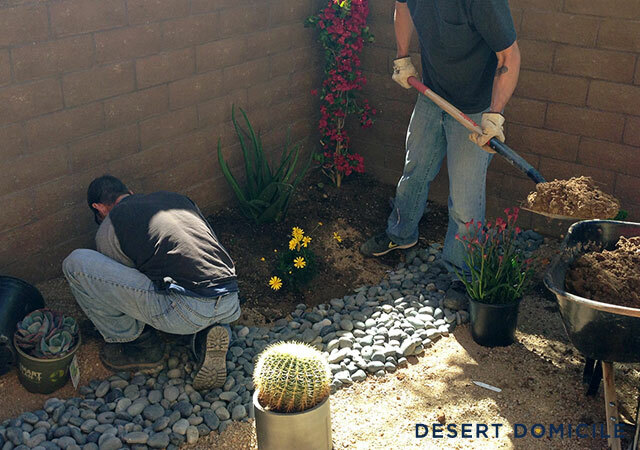 We started landscaping the sideyard when we realized that our originally planned paver pathway wasn't going to work due to our drainage issues. I wanted to repeat the materials used in our backyard so we made a dry river bed out of Mexican beach pebbles and pea gravel instead! 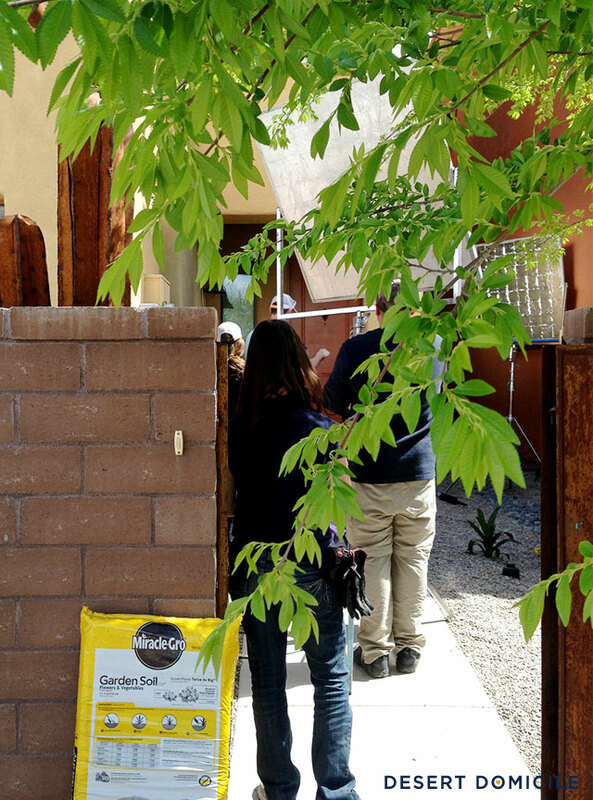 + The dry river bed was laid out and the plants in the courtyard were put in the ground. + The slatted screen was started and finished and the ceiling fan was installed. + Holes for the pipe curtain rod were drilled. + Furniture was cleared out of the POD and brought to the backyard. Things started to come together today! 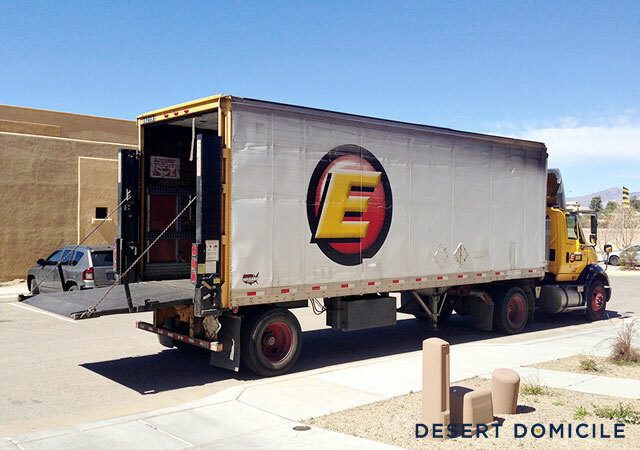 + Every arrived at various times. + We hung string lights on our back patio's beams. We also hung our outdoor curtain rod and succulent planter boxes. 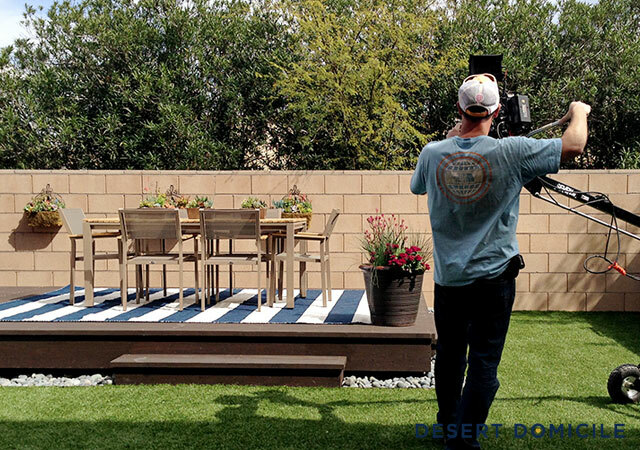 + The fire pit area, deck, and back patio were styled and filmed! + This was the busiest day so far but got a TON of filming done! + Filming took place all day and I didn't get a chance to take any photos. 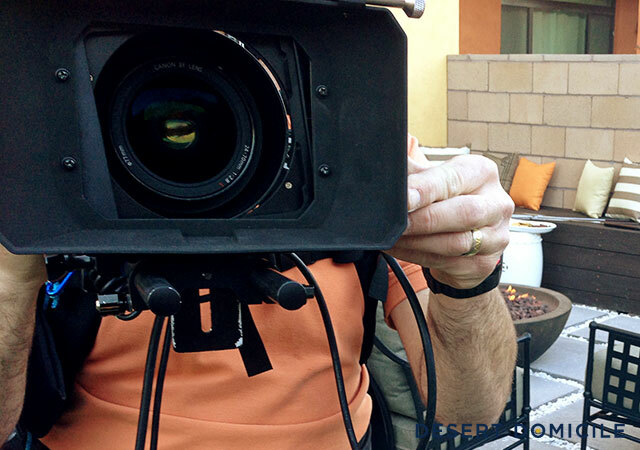 + I started the interview portion for the Patio Style Challenge video series. I felt a little better being on camera but I was still super nervous! + Everyone arrived at 8AM. + All of the beauty shots were filmed! + Brian Patrick Flynn arrived in the afternoon. He started setting up some shots while I was in the middle of my interview. + The wrap party began when the day ended! Hooray! My brother and sister-in-law stopped by to celebrate our new space with us! + Anyone that wasn't needed for the photography portion of the project left to go home. I had such a great time with everyone and was sad to see them go. + Brian and his team arrived at the crack of dawn to catch the early morning light. 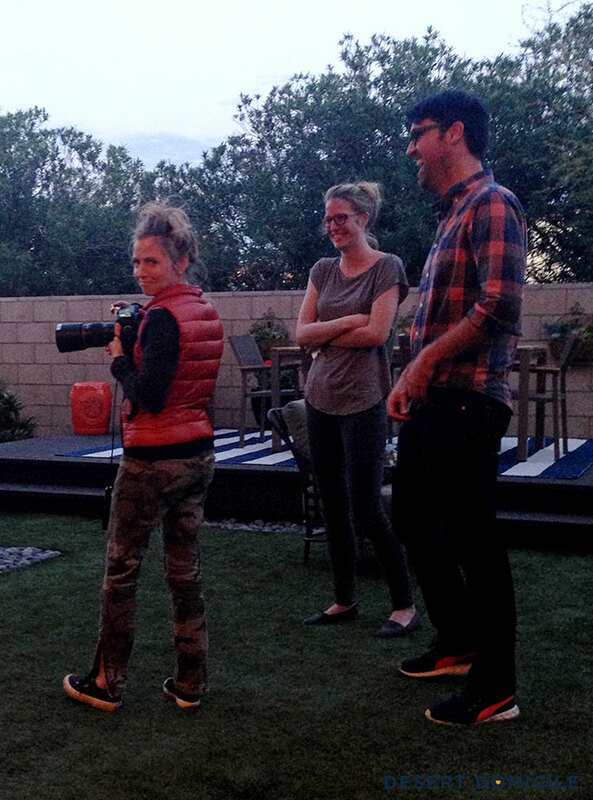 + He and his team photographed all of our outdoor spaces over the course of two days before heading home! Whew, what a whirlwind experience! I went back to my 9-5 job on Wednesday after everyone left. It felt weird to be sitting in an office and not outside spending time with everyone that had taken over our house for nearly two weeks. I worked harder than I ever had before but I had the time of my life and loved every second of it! I can't wait to show you the final reveal of our space tomorrow! Wait a minute, say what!?!?!? What is going on? This is totally insane...oh and happy easter. Whoo--sounds crazy and super fun! Can't wait to see more! Thanks Gretchen! It was all of those things and more! Hot damn! I'm exhausted just reading all of this (and probably something to do with the fact that I'm 9 months pregnant right now). But wow! I'm REALLY excited to see tomorrow's post! EEEP! Good for you for being able to have this amazing experience. You really are so talented and you absolutely deserve these kinds of things! Such a wonderful experience! So happy you had this opportunity. You're so talented, can't wait to see your full reveal. Oh my goodness, you've been a busy girl! Can't wait to see the magic you and the team created! Wow, Caitlin! I had no idea HD did behind the scenes videos like this. Now I'm even MORE excited to see your patio space!! What a wonderful whirlwind! I have a sneaky suspicion this is going to be rockin'!! Oh wow this looks like it was crazy and fun! 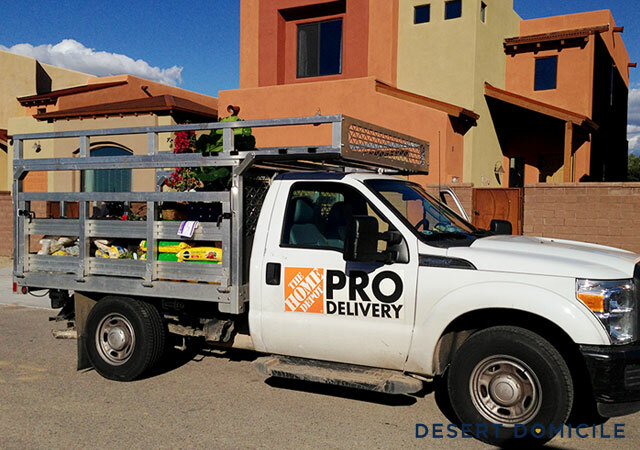 I want all my landscaping done THAT FAST with all that help :) send them my way next! Cant wait to see the final results! Amazing! I can't wait to see how it all came together. Sounds like the experience of a lifetime! Congrats! I'm really interested I doing something similar to the outdoor kitchen/grill area you had but I can't seem to find any instructions or pictures. Any help? I love everything about this backyard, just found it on pinterest. Is there a link to the grill station tutorial by chance? Thanks so much!